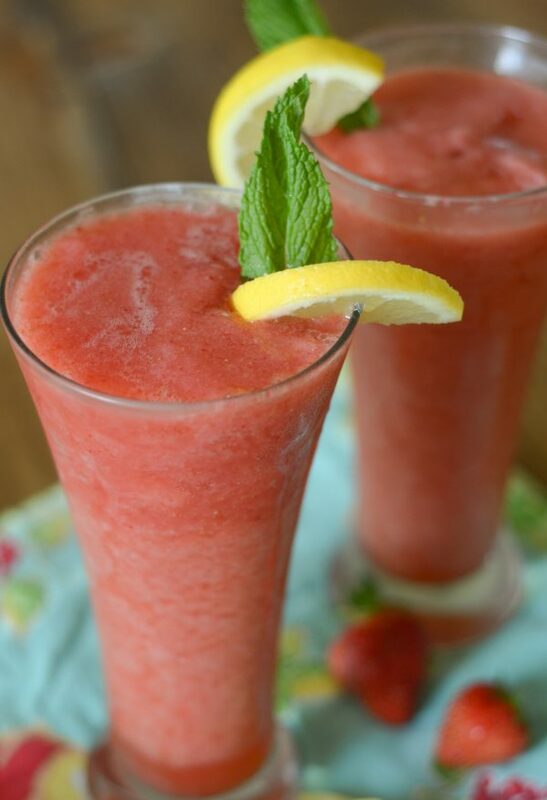 Cool off this summer with a Frozen Strawberry Lemonade Mocktail! It’s summer here in Oklahoma, unofficially, but it’s still summer! School is out, the temperature is basically FIRE, and the pool is ready to go! That’s right, I fully convinced my husband that we needed a pool. Well, I guess I can be honest and say really I just went and bought it. It’s better to ask for forgiveness than permission, right? 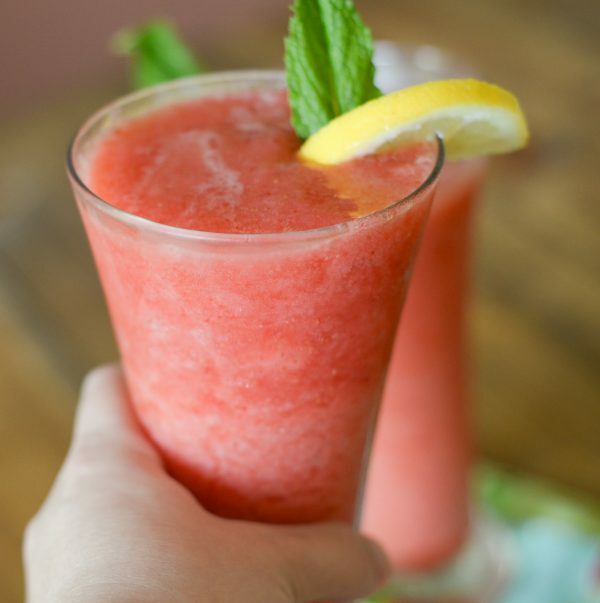 These Frozen Strawberry Lemonade Mocktails enjoyed poolside though are the ultimate summer treat! We installed an above ground pool this year to basically test the waters so to speak and be sure we like being pool owners. If it works out well then we will get a permanent one installed next year. So far, our whole family is in love, so I have a feeling we will soon end up with a larger one that is permanently installed soon. We’ve been enjoying basically all meals served poolside along with some tasty mocktails. The kids barely want to get out of the pool, so I’ve just been serving lunch and dinner right there near the pool. I love it too because then I don’t have to clean up the kitchen either! 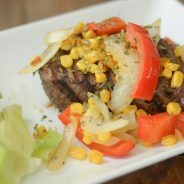 Who doesn’t love Filet Mignon served on paper plates? Ha! I’m not kidding, I totally did that too. 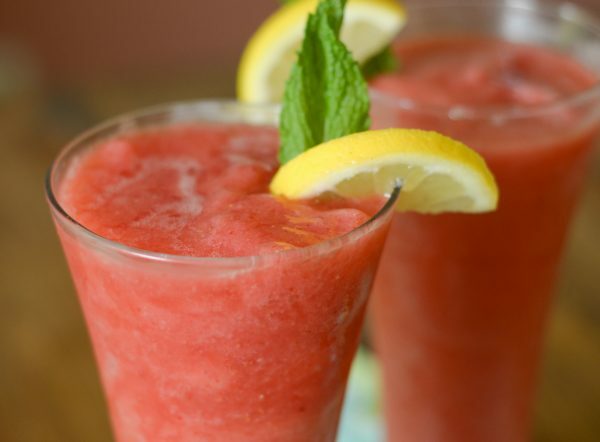 Now, let’s talk about these Frozen Strawberry Lemonade Mocktails. I actually used some garden fresh strawberries to make these, straight from our garden! 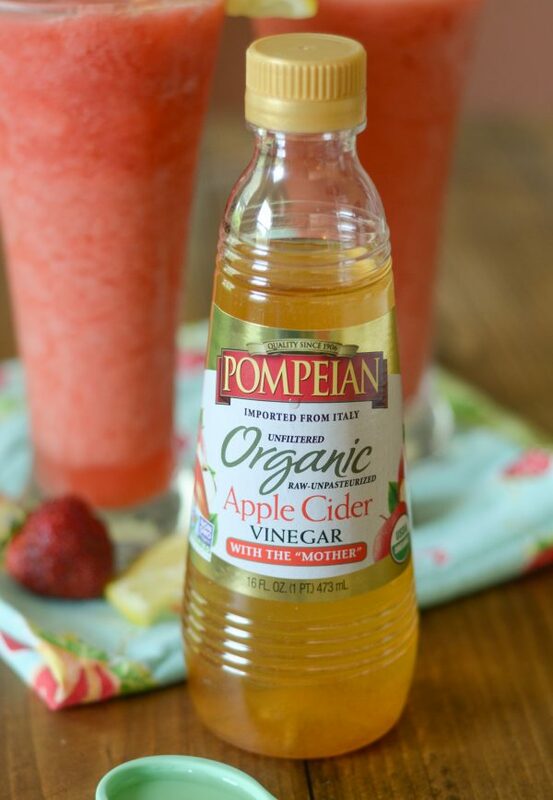 I added a little bit of lemon and then I added a tablespoon of Pompeian Organic Apple Cider Vinegar with the mother. This vinegar is actually a great addition and it’s actually said that consuming just 2 tablespoons offers the maximum benefit from the high volume of polyphenols, which can improve digestion and boost your immune system. Not only that but it also helps combat cholesterol, prevent dandruff, keep skin healthy, and even promote weight loss. It does just about everything! 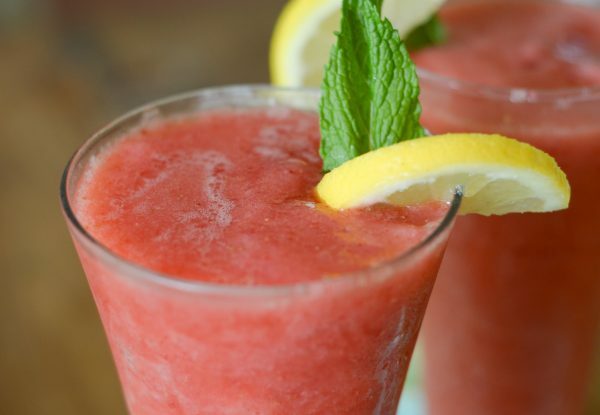 It’s even better when you can add it to a tasty mocktail and enjoy it in a delicious way. 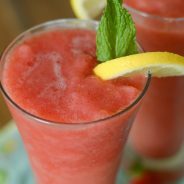 What is in the Frozen Strawberry Lemonade Mocktail? It’s simple ingredients that you’ll likely have on hand this summer. Remember for this recipe I didn’t add any extra sugar, so it is tangy. If you prefer it to be sweeter add some honey or sugar. Maybe you are wonder what the “mother” is in Apple Cider Vinegar? 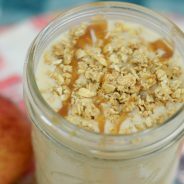 The mother is a dark, cloudy substance formed from naturally occurring pectin and apple or grape residues. It’s found in organic, unfiltered, and unpasteurized vinegar. 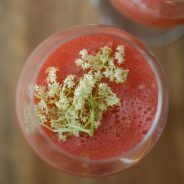 Now as we head into the summer are you ready to enjoy a great drink that is definitely #TrendingintheKitchen? 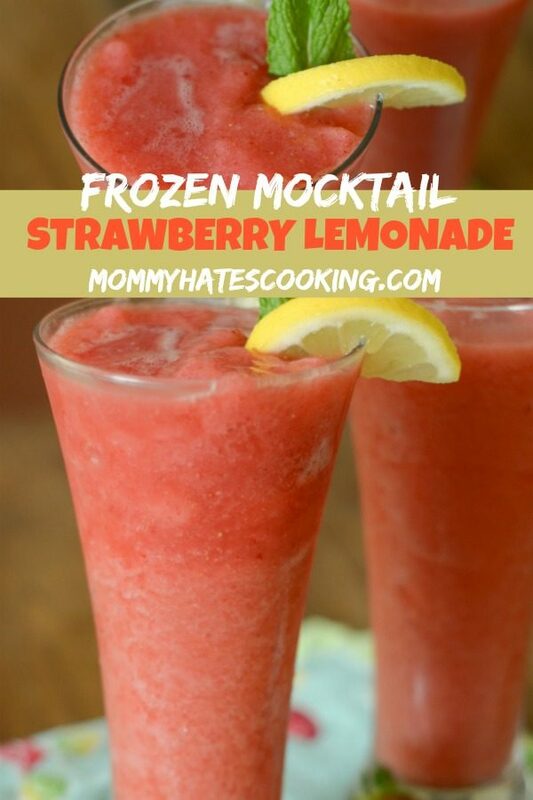 Be sure to sit back and relax with this Frozen Strawberry Lemonade Mocktail! Add in the juice from 1/2 of a lemon, reserve the remainder for garnish. Add in the vinegar and about 1/2 cup of ice. If it's too thick add about 1/2 cup water, then continue mixing until combined.